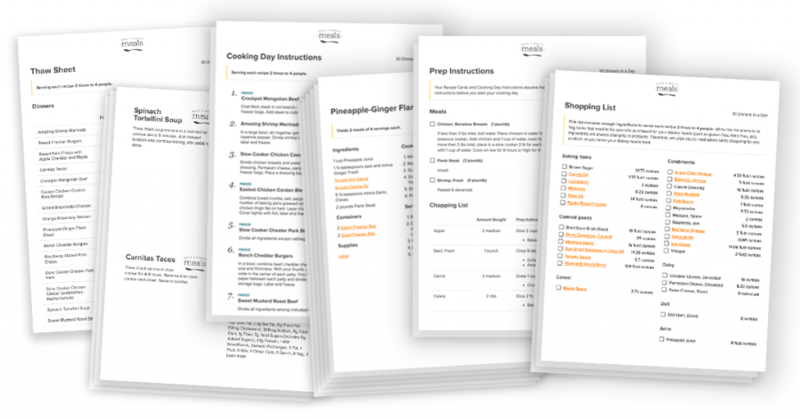 These menu resources are a streamlined set of instructions and directions that enable you to shop, prep, assemble, cook, and freeze a large or bulk amount of meals at one time, quickly and efficiently. We make updates to reflect all your changes. Whether you’re updating the serving size, deleting or adding a new recipe entirely, your ingredients, amounts, and instructions reflect every adjustment you make to your menu. We do all the math and conversions for you. Every combined ingredient calculation and measurement conversion is made for you, across all your recipes and instructions, so you don’t have to do it yourself. We double each recipe to maximize your time. 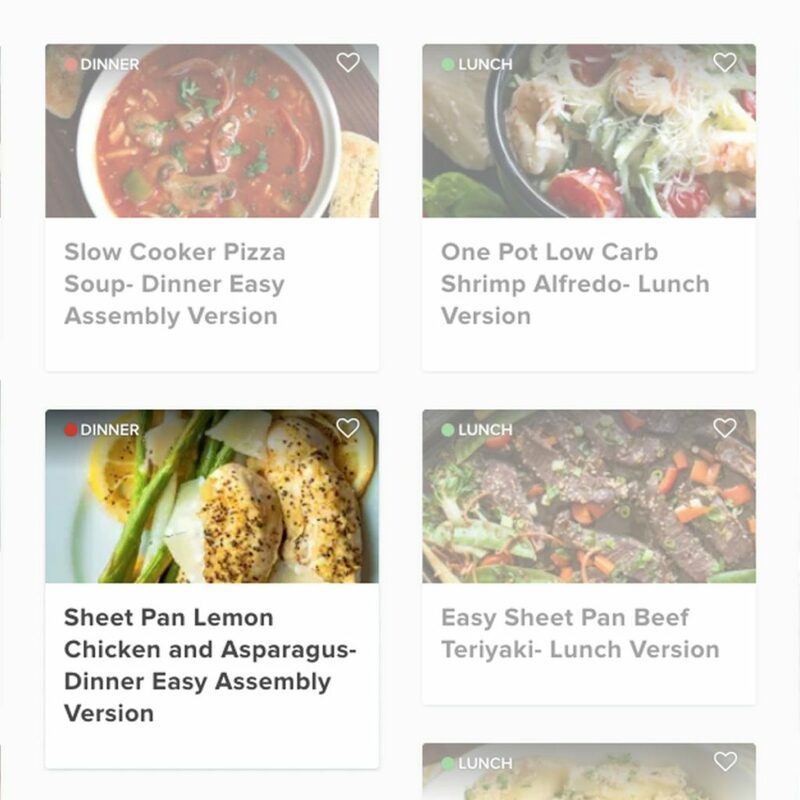 Each recipe is doubled to maximize the amount of money you will spend, the ingredients you will buy, and the time it will take you to prepare and assemble each meal. Our MenuBuilder software takes your chosen recipes and adjusts to any serving size. 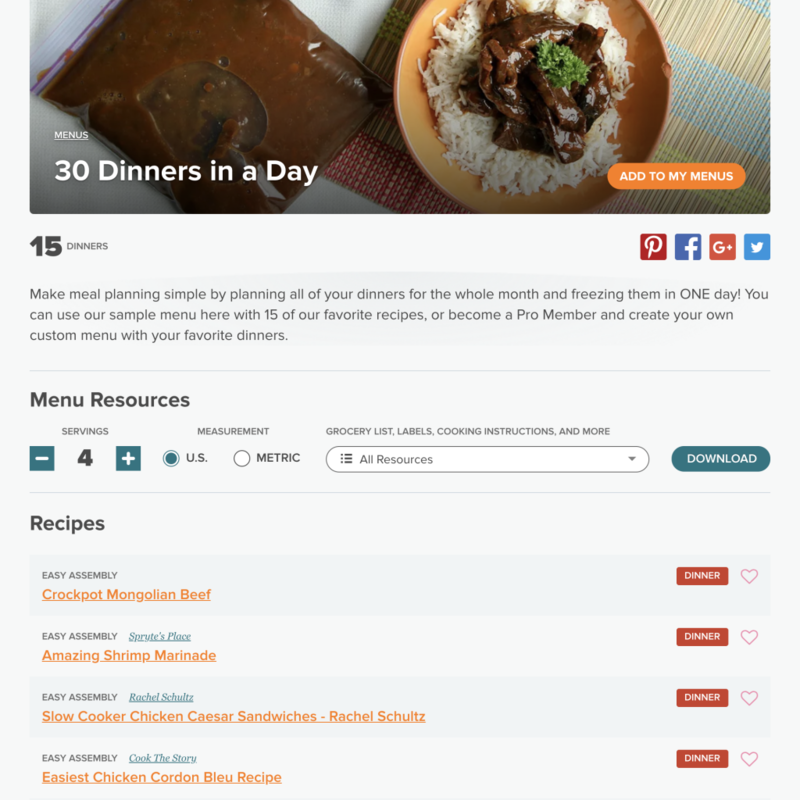 It then combines all of the listed ingredients, measurement amounts, and cooking instructions to produce a new, streamlined set of resources so that you can prepare your menu in one, simplified cooking session. 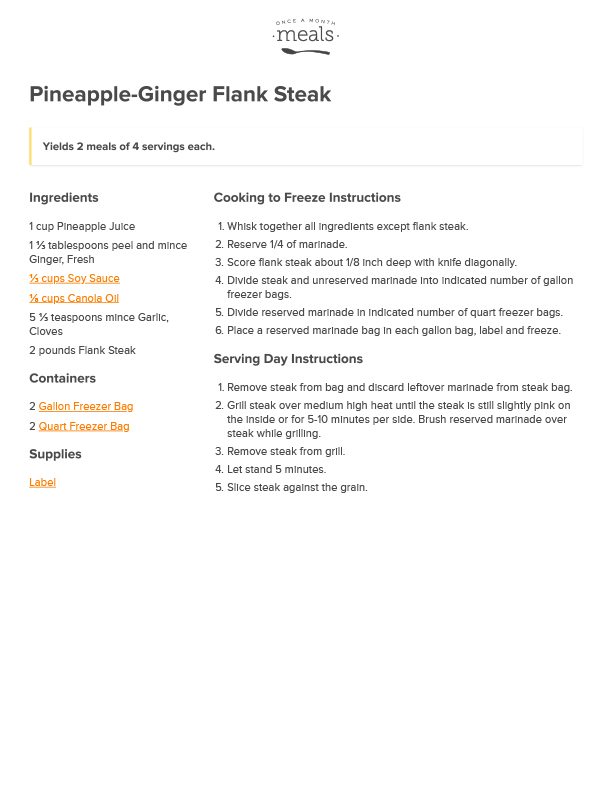 Add up to 15 recipes into your menu that are compliant to your dietary needs. Select a serving amount for your specific family size, no matter the number. Download your resources to any device, or print them immediately! ingredients for fast assembling and cooking. to assemble your menu as fast as possible. for each recipe for easy assembly. thawing or reheating your meal. of defrosting or reheating instructions. 1. 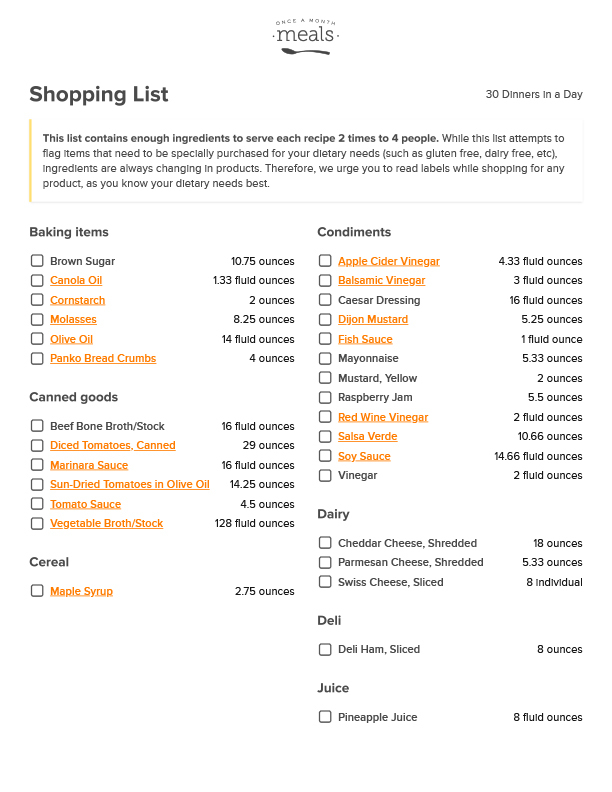 An organized Grocery Shopping List for faster and easier shopping. 2. 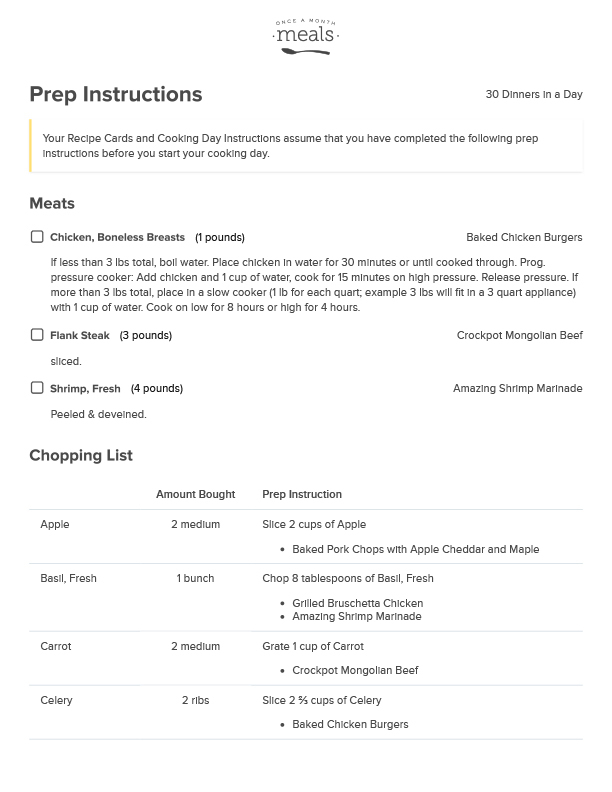 Prep Instructions to help you prepare all your ingredients ahead of time. 3. Step-by-step Cooking Day Instructions for fast and efficient freezer cooking. 4. 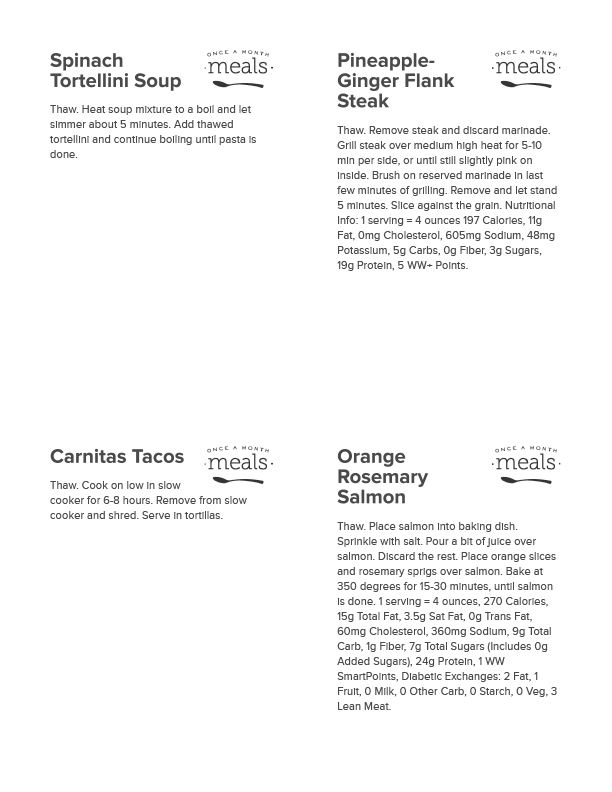 Individual Recipe Cards with detailed cooking and freezing instructions. 5. Printable Labels for your freezer bags with thawing and cooking instructions. 6. 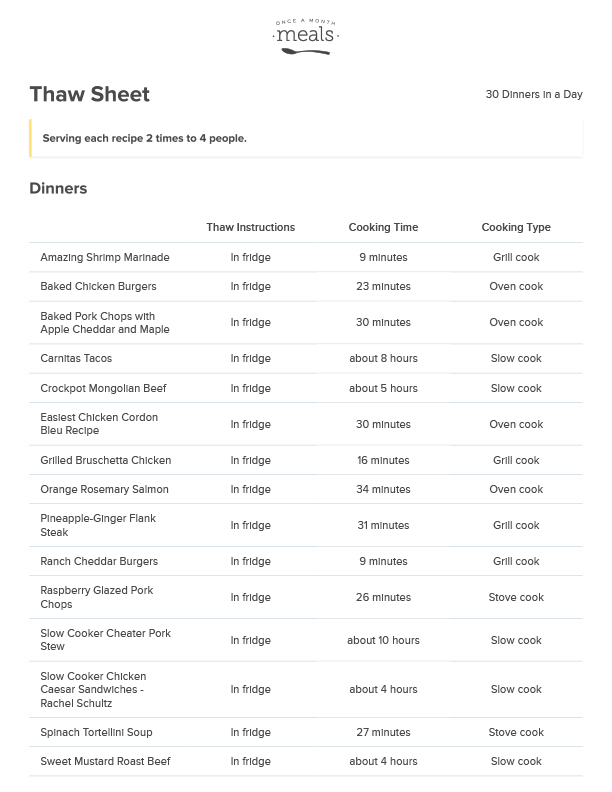 A Thaw Sheet for a full list of your menu’s defrosting or reheating instructions. Enables a faster and easier shopping experience with organized categories. Tip: Make your list and check it twice! The worst feeling in the world is to be missing one thing! Outlines how to prepare all your ingredients for fast assembling and cooking. 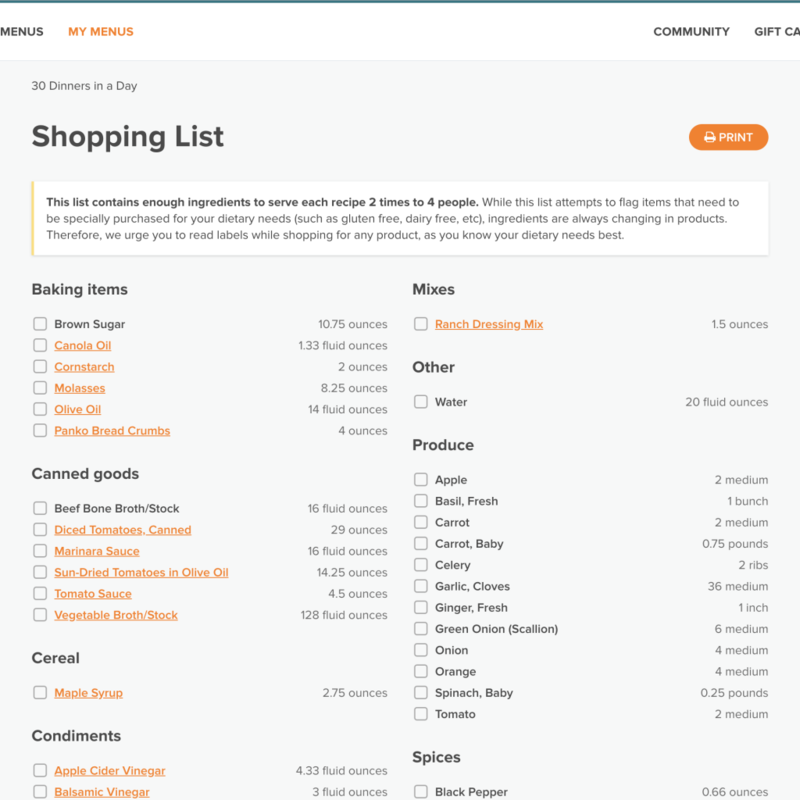 Lists ingredients with their associated recipe(s) so you know what goes where! Tip: Read this list fully before you start! We do all the math and conversions here for you, so you don’t have to make adjustments later on. So be sure to pay attention to the details! 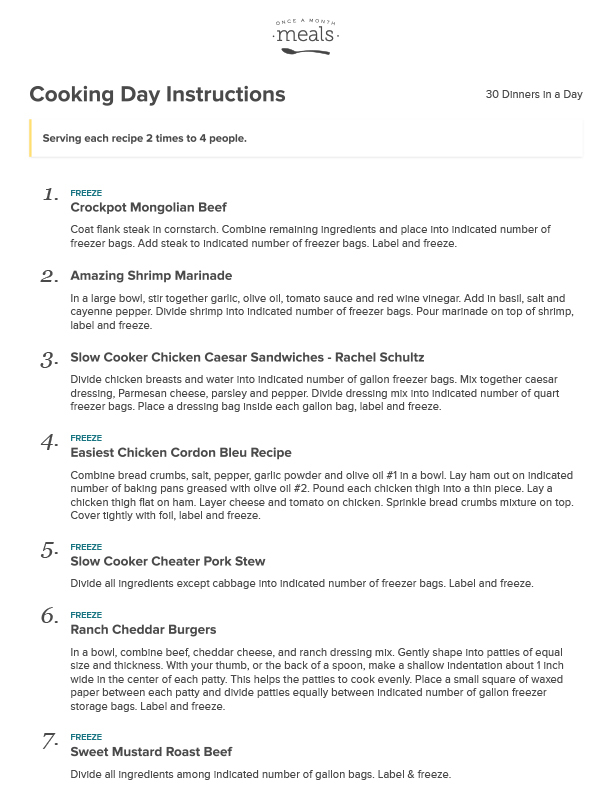 Breaks down instructions into steps to assemble your menu as fast as possible. Tip: Follow the order given! It will make assembling and cooking your recipes go by that much faster! Details cooking and freezing instructions for each recipe for easy assembly. Tip: Tape your recipe cards onto your cabinets while you are cooking for easy access and referencing! This way you are not sorting and fumbling with your hands while you cook! Lists instructions and detail for thawing or reheating your meal. Tip: Write the serving day ingredients on the label so you remember what you need when you go to reheat your meal! Ex: tortillas for tacos, sour cream for topping, etc. Captures the entire menus list of defrosting or reheating instructions. Tip: Tape this to your fridge and keep a tally of your meals so you know what you have in your freezer!